LoftCube’s mobile units range from 441 to 1,035 square feet. Prices start at about $122,400. No longer consigned to the basement or unused nook, the home office has emerged as one of the most important residential amenities, thanks to an uptick in both self-employment and flexible working trends. Whether they’re working for themselves or others, some 25 million Americans are calling home “the office” at least one day a week. Among them, 2.8 million self-employed people consider home their primary place of work, according to consultancy Global Workplace Analytics. With the number of at-home workers on the rise—the population grew 29.4 percent from 2005 to 2012—the need for workspace is constant and evolving. We asked architects, designers and space and product specialists for their take on the trends driving the home-office sector. With options ranging from integrated systems to stand-alone “shedquarters,” at-home workers aren’t just making do; they’re making their own ways to work. A loft conversion by Albertsson Hansen Architecture features an office tucked away behind the bed’s headboard. Tidiness is increasingly at the center of home-office design, thanks in no small part to Marie Kondo, author of the bestselling book The Life-Changing Magic of Tidying Up. Kondo’s neatnik ethos applies to everything in the home. In the office, she extols the pleasures of purging—not just books and paper but elaborate storage systems, which can be ditched in favor of shoe boxes. she says, for people who must hang on to archives, product samples or equipment. Christine Albertsson, principal at Minneapolis firm Albertsson Hansen Architecture, says the “conversation about stuff” is one of the first she has with clients. “There’s a move toward minimal space that’s smart and uplifting and not cluttered,” she says. “Every person should go through their house and assess what they really need.” That includes a reevaluation of equipment, which she calls “a shifting issue,” as technologies for entertainment and work become less segregated. “When people want a TV in the computer room, I say just use your computer,” she says. Dowell agrees, noting that home offices are organized around the realities of space. “You used to have to think long and hard about what kind of computer you had—where does the tower go?” he says. But now, “the technologies don’t take a lot of space—everything is done from a laptop, projectors are small and with wireless printers, it’s really about making sure you have the cabinet space for them. There's a move toward minimal space that's smart and uplifting and not cluttered. 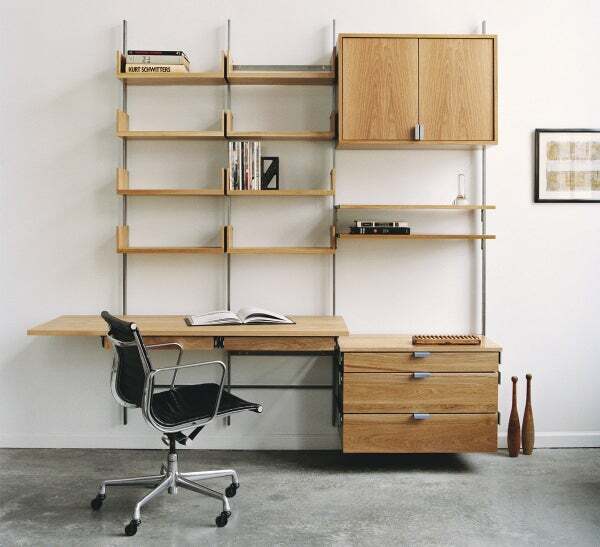 Modular wall systems from Atlas Industries are crafted from solid hardwoods and steel. “Acknowledge that your workspace may not be just one area, and it shouldn’t be,” says productivity expert Marissa Brassfield, founder and CEO of San Diego-based Ridiculously Efficient. Brassfield mixes up her routine with occasional stints in a shared workspace but spends most of the time in her backyard shed office. Designed in the style of a retro airport lounge, it also serves as a party room; along with a 20-inch monitor, a stand-up work bar and a wall painted with whiteboard paint, she has a wine fridge and travel memorabilia. 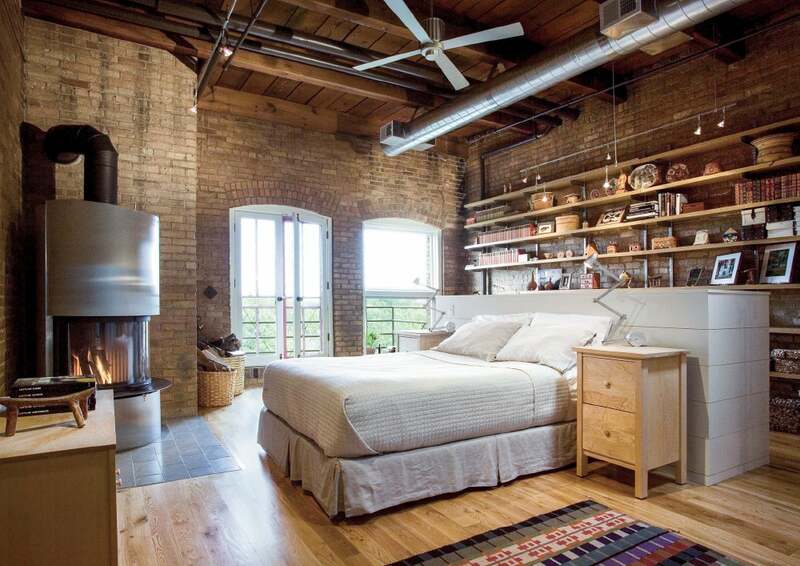 When Albertsson took on a Minneapolis warehouse conversion—the ultimate visual expression of work and home—she fashioned an office in a loft using the headboard of a bed as a screen that hides the workstation. The upholstered half-wall conceals the desk, computer and research materials, yet is integrated with the rest of room, displaying travel souvenirs as a backdrop. Other projects architects say are in demand from their clients include “command centers” that are open to the kitchen and “homework bars” where children and parents can work together. “Non-compartmentalization of residential space is very important to our clients, but there needs to be an understanding on how to make an important separation when people want to have that,” Albertsson says. San Francisco designer Tineke Triggs says the trend of clients who “don’t want things to look like offices and want them to feel more like living rooms” is driven by the local tech culture. Following the playful design lead of many tech headquarters, “people are wanting to do their offices as their getaway spaces, where they can be relaxed and thoughtful without being corporate and sterile,” she explains. 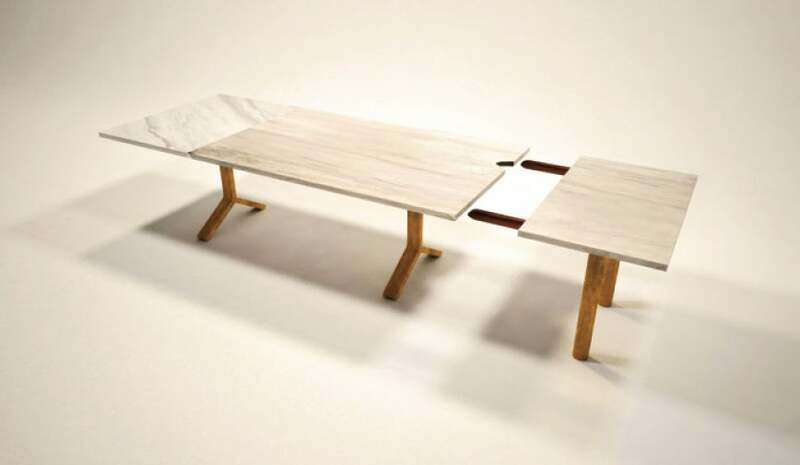 An extendable table from Uhuru Design combines bleached maple with marble. In most homes, where every square foot counts, there’s been a rethinking about furniture. Artisan designers have stepped into the game, making inroads where dedicated built-ins once reigned. In addition to combining function and style, such craftsmen have layered a sort of cognitive feng shui into work surfaces that feel as good as they look. Atlas’ online drag-and-drop tool helps users design their own systems, which they can send in for a prompt estimate. (We requested a 64-by-87-inch system of four shelves, a pencil drawer, upper cabinet and about 72 inches of surface space, and received an estimate of $7,477, sales tax not included.) Though not cheap, the units pay for themselves in terms of increased productivity, according to Wright. Tapping into the organic, modern furniture movement, Brooklyn-based Uhuru Design created a line of furniture that co-founder Jason Horvath says is increasingly used by people who want a combined workspace and statement piece. His workshop creates custom furniture from reclaimed heritage materials, such as tables made from Kentucky bourbon barrels or salvaged pieces of the Coney Island Boardwalk. Horvath, whose workshop does high-end commercial projects for companies such as Tekserve, an independent Apple retailer in downtown Manhattan, says the demand for stand-up desks in the commercial environment has flowed over into the home office. Since all of Uhuru’s work is custom, he can build desks to any height and is prototyping a fully adjustable-height desk. Midcentury-inspired modules from KitHaus start at $32,500 for 117 square feet. A new offering is in the works for musicians: Studio Sheds featuring Auralex Acoustics Studiofoam. The kits range from $13,000 to $30,000; the online design feature has an estimator that calculates costs in real time. 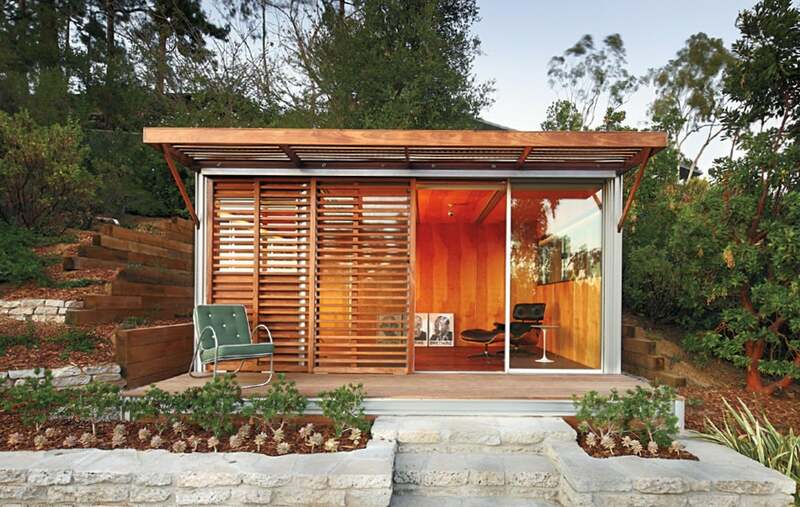 Enthusiasts of midcentury modern architecture are turning to KitHaus, which constructs sheds with a nod to the Case Study Houses of the 1940s to 1960s, designed by luminaries such as Richard Neutra and Charles and Ray Eames, that gave Los Angeles an architectural edge. “California’s experimental housing started with midcentury architects, and ours has definitely taken that direction,” says Tom Sandonato, who co-founded L.A.-based KitHausin 2005. Though most of the installations are in the West (San Diego is a major market), some have popped up in affluent communities in Connecticut, New Jersey and Pennsylvania. A KitHaus also adorns the rooftop of the Marianne Boesky Gallery in Manhattan’s Chelsea art district. Taking that thought a step further—or a story higher—is LoftCube, a German company specializing in mini-structures for a variety of uses. CEO Christian Friedrich sees rooftop real estate in cities and “all other areas where you like to have an exceptional view” as the probable landing pad for his space-age-looking cubes. LoftCube models start at 109,000 euros (about $122,400); the two-level model is 289,000 euros (about $325,000). Plans are underway to launch in the U.S.